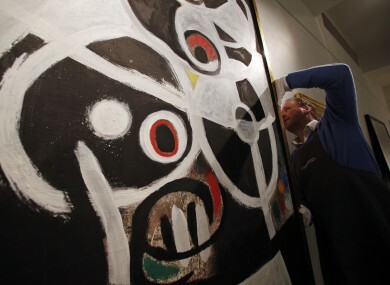 An auction house worker adjusts Joan Miro's 1968 oil painting "Women and Birds" at Christie's auction house in London. PORTUGAL IS HOPING to make back some of the money it used to bailout the banks by selling artworks by a master of surrealism, Spanish artist Joan Miro. The government is selling 85 works by Miro in a hope to recoup some of the millions of taxpayers’ money they lost rescuing a failed bank that became public property when Banco Portugues de Negocios was nationalised in 2008. The auction has stirred controversy, however, with some Portuguese demanding the trove be exhibited. Hours before the auction was due to start, a Lisbon judge was still weighing the main opposition Socialist Party’s request for an injunction to stop the sale. The government says the bailed-out country’s austerity drive has left it short of cash for spending on culture, and it says the Miro collection is not one of its priorities. Portugal needed a €78 billion international rescue in 2011 to spare it from bankruptcy. Miro was a senior figure in the surrealist movement in the 1920s and went on to establish himself as a sculptor and ceramicist during a seven-decade career. He is credited with influencing a generation of abstract expressionists, including American artist Jackson Pollock. Two of the Spanish artist’s oil paintings are expected to fetch the highest bids, according to Christie’s: “Women and Birds” from 1968, which has an estimated sale price of £4-£7 million pounds (€4.8 – €8.4 million) and “Painting,” valued between £2.5 million and £3.5 million pounds (€3 million and €4.2 million). The current auction record for a Miro is almost $37 million (€27 million) paid for “Painting (Blue Star)” in 2012. Other art collections have been offloaded in the past, like that after the collapse of Lehman Brothers and South Korean savings banks who have brought works by big-name artists to market in recent years. Anglo Irish Bank and the Bank of Ireland of also sold off some of their works. Like elsewhere, though, the Portuguese auction will barely make a dent in monies owed: Christie’s has estimated the Miro collection at around €36 million, but the 2008 collapse of Banco Portugues de Negocios left taxpayers at least €3.4 billion out of pocket. The Lisbon trial of 15 people allegedly to blame for the bank’s collapse, amid allegations of corruption, fraud and mismanagement, is three years old. Email “Austerity sale: Portugal hopes to recoup bank bailout cash by selling art ”. Feedback on “Austerity sale: Portugal hopes to recoup bank bailout cash by selling art ”.